This post is sponsored by OXO. I’ve got an end-of-summer treat for you today! 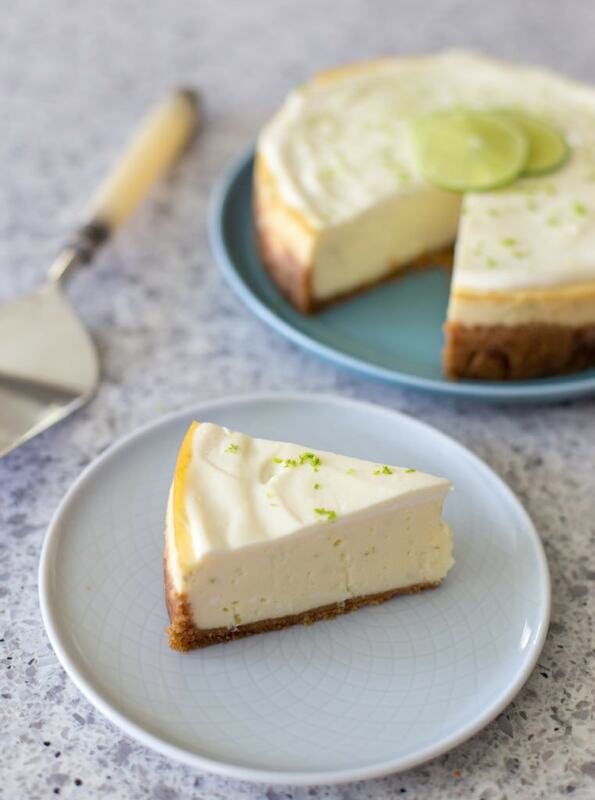 This New York-style cheesecake is bursting with the tangy flavor of fresh limes, and since it’s cooked in the Instant Pot, it won’t heat up your kitchen. 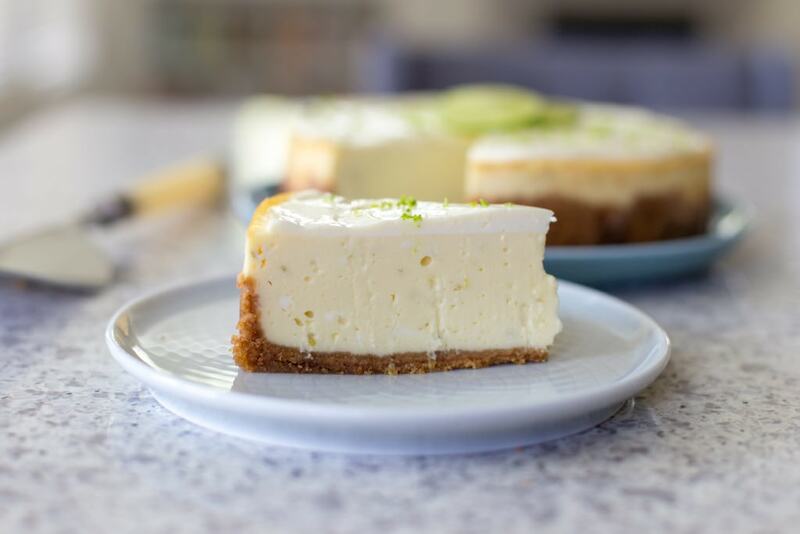 It’s the perfect dessert for a dinner party, backyard barbecue, or whenever a cheesecake craving hits. 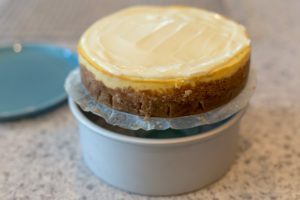 I’ve been making Instant Pot cheesecakes for a few years now. 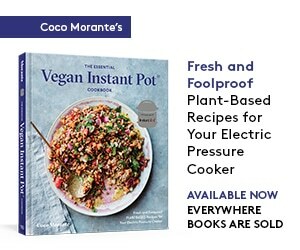 In the beginning, the trickiest part was figuring out how to lower and lift the pan in and out of the high-sided Instant Pot. At first, I used a long piece of aluminum foil folded into a strip, which acted as a sling underneath the pan, but I often wished there were a better, less wasteful option. Imagine my excitement when the clever team at OXO told me they were designing exactly the tool I had in mind! 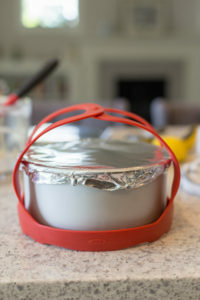 The OXO Silicone Pressure Cooker Sling is officially my favorite tool for pot-in-pot cooking. It’s made of flexible, dishwasher-safe, sturdy silicone. The large, easy-to-grip handles snap together so they fit inside the pot, and it only takes one hand to lift. 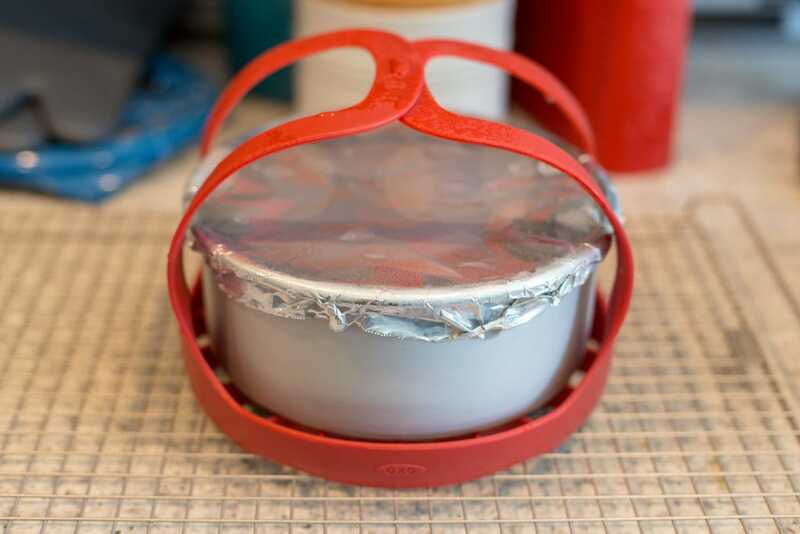 It also has a thick, honeycomb-patterned base, which keeps the pan out of the water, so it functions as both a steam rack and a sling, all in one. Truly genius. 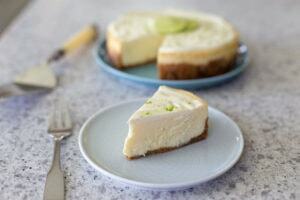 As you can see, Instant Pot cheesecakes come out creamy, easy to slice, and silky smooth. I think this one is my favorite I’ve made so far. To make things easy, I’ve used regular (a.k.a. Persian or Tahitian) limes. If you are able to track down Key limes (and want to go to the trouble of juicing those tiny fruits), by all means go for it! 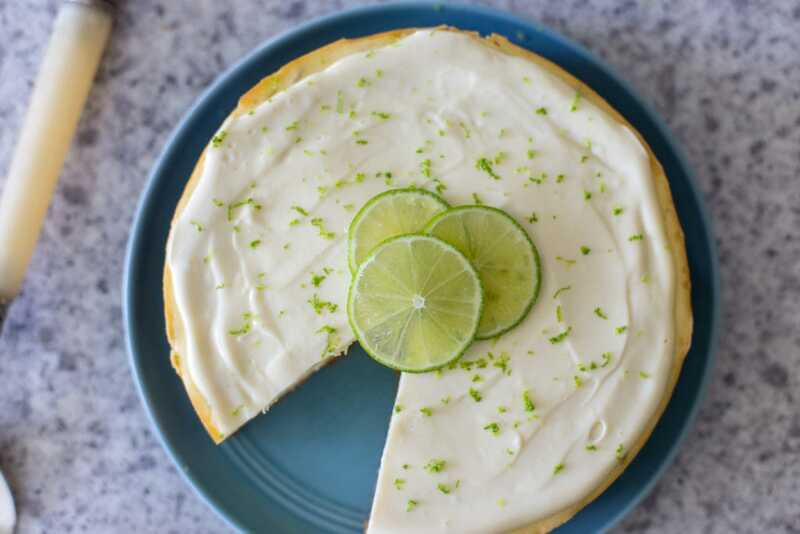 The cheesecake will be delicious whichever citrus you choose. Enjoy! Tangy, sweet, and perfect for summer. 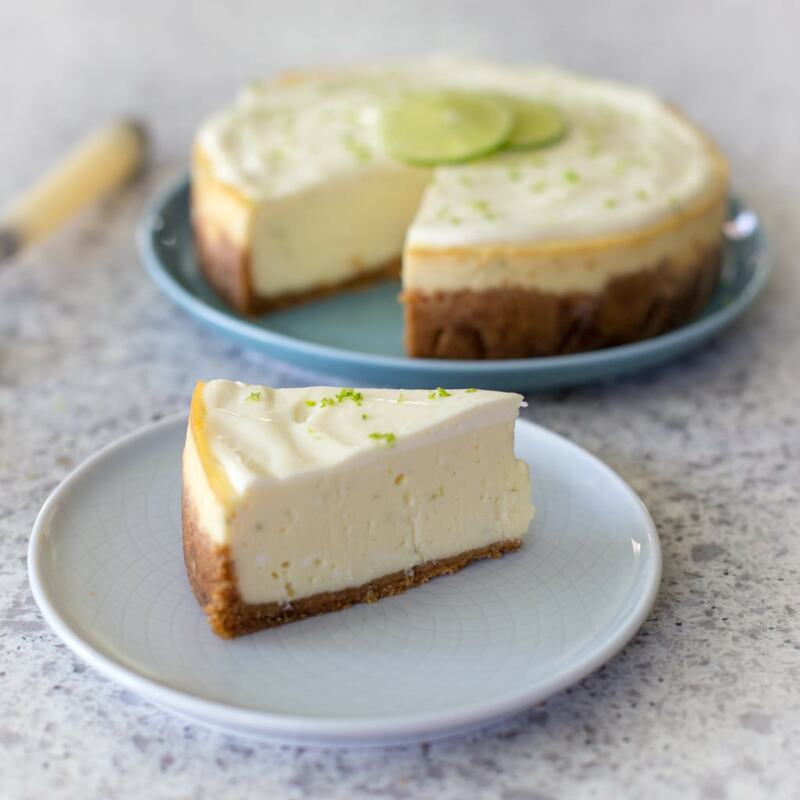 This cheesecake won't heat up your kitchen since it "bakes" in the Instant Pot! Lightly grease the sides of a 7-inch round, 3-inch tall push-pan or 7-inch springform pan with butter or nonstick cooking spray. Line the base of the pan with an 8-inch round of parchment paper. 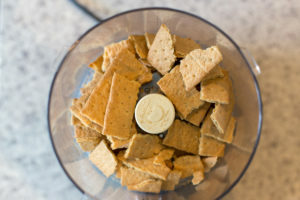 To make the crust: In a food processor, process the graham crackers to fine crumbs. Add the brown sugar and melted butter. 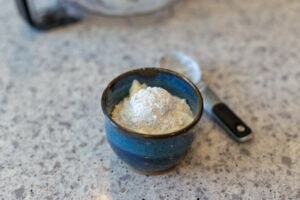 Using 1-second pulses, process until the mixture resembles damp sand. 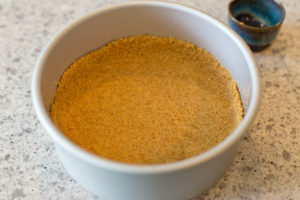 Transfer the crumb mixture to the prepared pan and press firmly into an even layer on the bottom and about 1 inch up the sides of the pan. Place the pan in the freezer to allow the crust to firm up a bit while you make the filling. Wipe out the food processor. 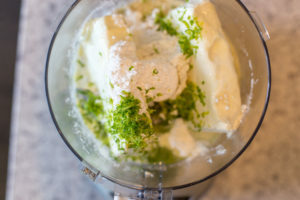 To make the filling: In the food processor, combine the cream cheese, confectioners’ sugar, cream, lime juice, lime zest, and cornstarch. Process in about five 1-second pulses, just until smooth (there will still be flecks of lime zest). One at a time, add the eggs, processing for two 1-second pulses after each addition. Do not overprocess the filling, or you will end up with an overly fluffy cheesecake. 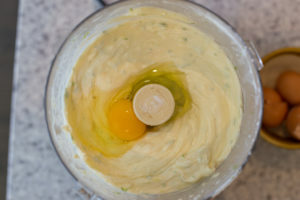 Using a silicone spatula, gently stir in any large streaks of egg yolk, but it’s fine if a few small streaks remain. Pour the filling into the prepared crust. 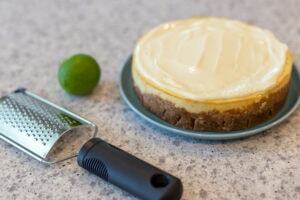 Tap the pan firmly against the countertop a few times to remove any air bubbles in the filling. If you're using a 3-inch tall pan, cover it tightly with aluminum foil. If you're using a shorter springform pan, leave it uncovered. 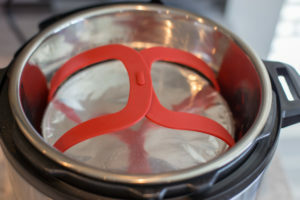 Place the pan on the OXO Silicone Pressure Cooker Sling. 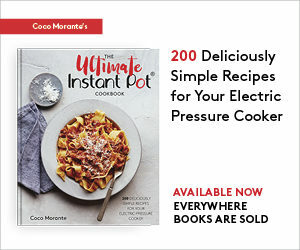 Pour 1 1/2 cups water into the Instant Pot. Holding the handles of the sling, lower it into the pot. 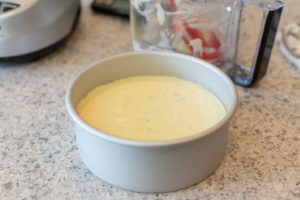 While the cheesecake is cooking, in a small bowl, stir together the sour cream and 1 tablespoon of confectioners’ sugar. 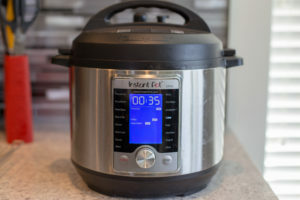 When the cooking program ends, let the pressure release naturally for 20 minutes, then move the Pressure Release to Venting to release any remaining steam. Open the pot and, wearing heat-resistant mitts, grab the handles of the pressure cooker sling, lift the pan out of the pot, and set the pan on a cooling rack. 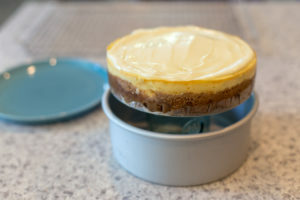 When the cheesecake has deflated about 1/2 inch (this should take 5 minutes or so), use a spatula to spread the sour cream mixture on top in a smooth, even layer. 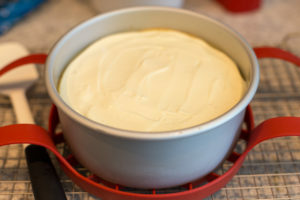 Let the cheesecake cool on the rack for about 1 hour, then cover and refrigerate for at least 12 hours or up to 24 hours. 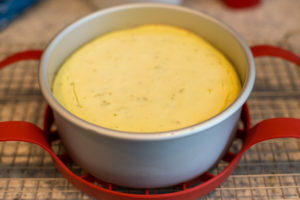 When you’re ready to unmold the cheesecake, run a knife around the sides of the pan. Place a drinking glass on the countertop and place the push pan on top. Gently push down on the collar of the pan, leaving the cake on the bottom round of the pan. Unpeel the parchment from the sides of the cake, then wedge a thin, flexible turner between the parchment and the cheesecake, and use the turner to carefully slide the cake off of the parchment and onto a serving plate. 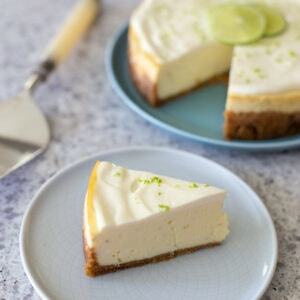 Top the cheesecake with lime zest and slices, then slice and serve. Thank you to OXO for working with me on this series of sponsored posts! All opinions are my own.